Users are 5x more likely to open a message with a personalized subject line. No brainer? You'd be surprised. Today, 80% of marketers personalize emails, but less than half use any other media such as social networks, web landing or home pages, display or search advertising, or in-app mobile messaging. 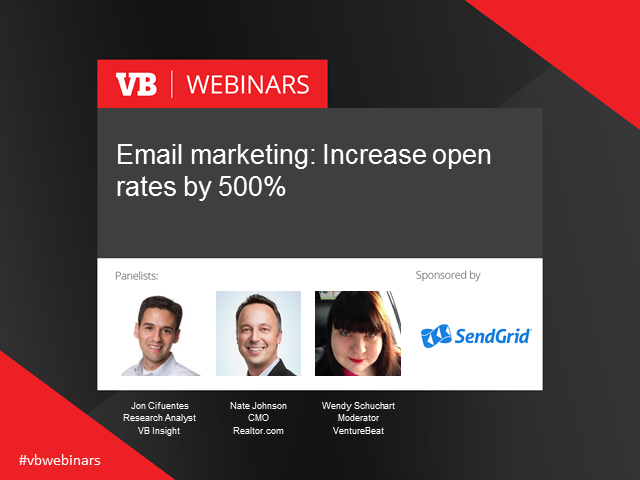 VentureBeat Research Analyst Jon Cifuentes will discuss effective, often unexplored benefits of marketing personalization and other less understood elements of email marketing. Our panel of practitioners will share insights, best practices, and tips into how they use the power of email marketing to engage with customers and build their brands. Got the message? Register here for free.